The neat thing about the Canadian Shield is that it is Precambrian rock that has not been buried by far younger sediments. Thus you get a window in time that is an order of magnitude greater that anything else on Earth you are likely to check. There are actually a lot of craters on this shield even if many are still unidentified. At present, we are finding the elephants. 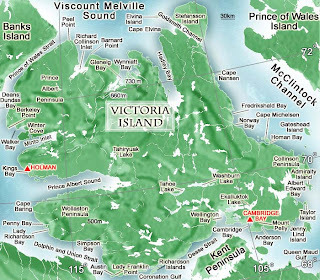 Here we discover a crater on Prince Albert Peninsula on Victoria Island that is 15 miles across. This is also a reminder that many craters are not easily discernible from the air. One gets spoiled when in many cases glaciation has scoured out the weaker rocks to form a network of lakes that scream crater. This one took serious boots. Researchers in Canada's western Arctic have found evidence of a crater that formed when a huge meteorite slammed into Earth millions of years ago. 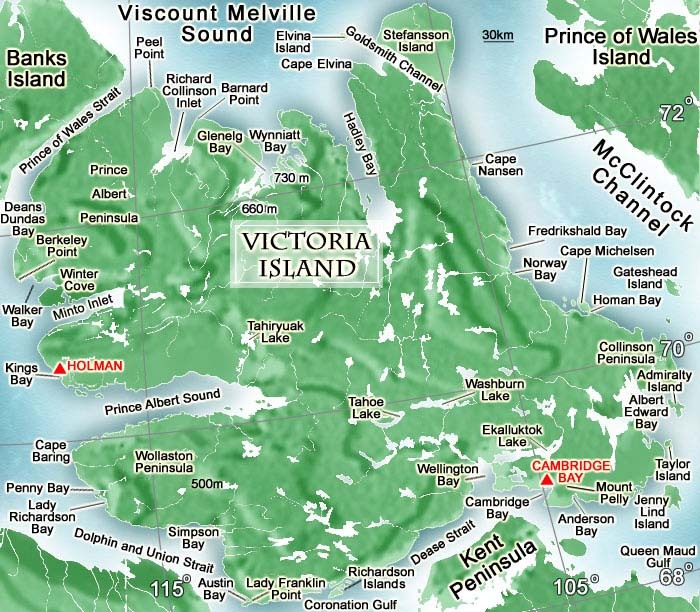 Measuring about 15 miles (25 kilometers) across, the formation was named the Prince Albert impact crater after the peninsula where it was discovered. Researchers don't know exactly when it was created, but evidence suggests the crater is between 130 million and 350 million years old, according to a statement from the University of Saskatchewan. Meteors are fragments of asteroids or comets that enter Earth's atmosphere at high speeds; most are small, some as tiny as a grain of sand, so they discintegrate in the air, and only rarely are they large enough to make it to Earth's surface. When meteors slam into Earth, they are called meteorites. "Unless you recognized the telltale clues, you wouldn't know what you were looking at," researcher Brian Pratt explained in the statement. "You might see a bunch of broken rocks and wonder how they got there, but we found abundant shatter cones." Shatter cones are surface features with distinctive wavy patterns that are known to be created only by the tremendous force of a meteorite impact or an underground nuclear explosion. What's more, Pratt said his map showed that the feature is circular, which is characteristic of impact craters. "Impact craters like this give us clues into how the Earth's crust is recycled and the speed of erosion, and may be implicated in episodes of widespread extinction of animals in the geological past," Pratt said. "It's an exciting discovery." There are about 180 known impact craters on Earth. Geologists think they would find countless more if plate shifting, volcanic activity and erosion didn't hide the evidence of most ancient impacts. Earlier this summer, researchers in Greenland documented possibly the oldest and largest meteorite crater ever found on Earth. The crater, estimated to be 3 billion years old, currently measures about 62 miles (100 km) across. But the researchers believe its width before erosion was likely more than 310 miles (500 km) — much bigger than the largest visible crater, the 2-billion-year-old Vredefort crater in South Africa, which measures 186 miles (300 km) across. Right now we could use one to hit DC and end the problems this nation is under by getting rid of those that have taken over this country for their own evil desires. Ah, but I understand that it is easier to win a big lottery then it is to be hit by a meteor and none of us can wait around for a few hundred million years or more for that to happen.